Jumping up to assist, he found Normand Peloquin looking very pale and haggard. Noticing the start of major swelling, Jean discovered that, approximately 30 minutes earlier, M. Peloquin had been stung by an insect. An anaphylactic attack was suspected due to the facial swelling, difficulty breathing, and a swollen tongue. As the individual had never had any sort of reaction to stings before, he was unaware of his allergy. Jean called out to see if anybody had an EpiPen, and a woman nearby offered hers. He then explained the procedure, and assisted M. Peloquin to inject the epinephrine into his thigh. Emergency medical services had been called, and Jean continued to monitor the patient and noticed an improvement in breathing. Jean helped the patient off of the train and stayed with him until medical assistance arrived. Once he turned his patient over to the next level of care, Jean continued on his way to work. The first ambulance to arrive on scene did not have epinephrine on board, and a second ambulance was dispatched. It was not until about half an hour later that a second dose of epinephrine was administered. Had Jean not been present to recognize the signs and symptoms, and administer the first dose of epinephrine, the outcome could have been very different. 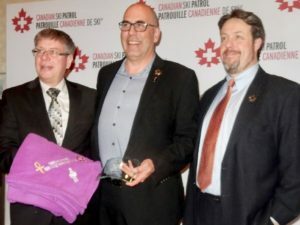 For his quick thinking, and lifesaving action, the CSP was very pleased to honour Mr. Jean Côté with the John D. Harper Lifesaving Award at the Altitude conference in Quebec City this year.